A rare sight was witnessed by the people of Mumbai’s Versova beach when hundreds of tiny olive-green turtles walked towards the Arabian sea. These little hatchlings, from a vulnerable turtle species, were spotted in the southern end of Mumbai’s Versova beach after decades. This, however, is not something that has happened by chance. The credit of this goes to one man, who has put in persistent efforts and hard work. 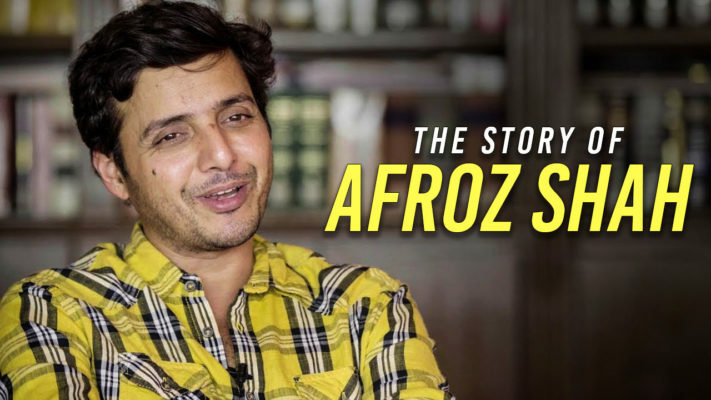 Afroz Shah, a lawyer by profession, is the man behind what the United Nations has called the “world’s largest cleanup project”. Over the past two years, Mumbai’s Versova beach has gone from being a dump yard to being a clean and pristine coastline. which now also serves as the breeding ground for sea turtles. 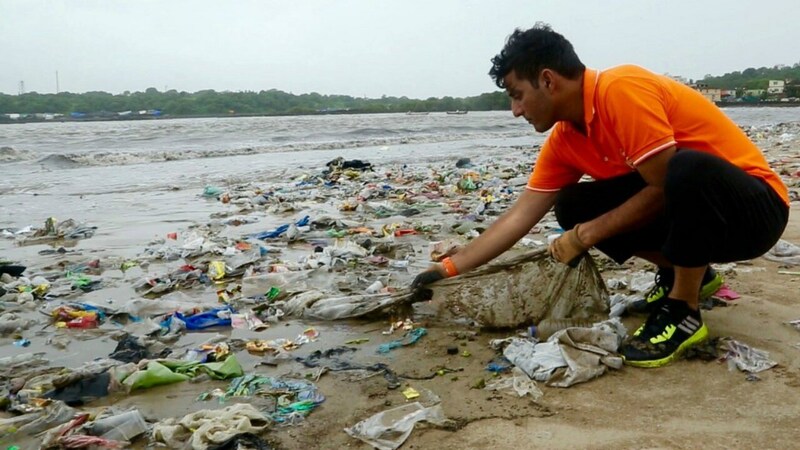 In 2015, when Afroz Shah moved to his new apartment near Versova beach area, he noticed huge piles of plastic waste, some of which was as high as 5.5 to 6 feet tall. 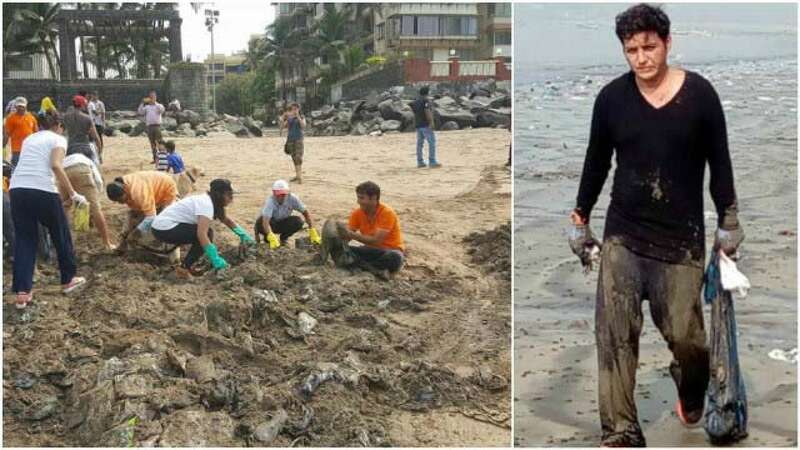 He along with his neighbour Harbansh Mathur (who passed away shortly after that) decided to take up the work of cleaning the beach, and this was the inception of this mammoth task. Seeing the efforts put in by these two, a group of local residents volunteered into the same and almost 50,000 kilograms of waste was cleared off the shore. What started as a drive grew into a massive movement and eventually, more than hundreds of volunteers from different walks of life came together and soon the Versova Resident Volunteers(VRV) group was formed. Till date, the team has cleaned almost 5 millions kilograms of trash from the beach. This clean up includes cleaning of public toilets around the beach, to check for the sewage waste, cleaning of the plastic waste, planting hundreds of coconut trees as well as sensitisation drives for the people. During the first few days, Shah would go from door to door, educating people and setting an example by taking up the work himself. Since then there has been no looking back for him or the movement. The initiative has garnered support from across the world: from political leaders, international organisations and celebrities from all walks of life. It now has almost 300 volunteers weekly and the numbers are only increasing. The initiative suffered a minor set back when Shah decided to suspend the cleanup drive in its 109th week because of the institutional lethargy and the harassment of the volunteers by the local goons. It, however, came back to life in the days that followed when the government and different political parties assured their full support to the cause and the movement. There is no doubt that the environment has been at the receiving end of the human’s greed, and it has been the biggest sufferer in the process. We see drying rivers and melting ice and killing draughts and blame the climate change for it but we fail to look beyond it and look at our own roles in bringing about this climate change. It is times when washed up dead whales and disappearing dolphins make it to national news, Mr Shah’s efforts and the return of these olive greens give us hope that all is not lost and if we try really hard we might be able to undo what we have done to the earth. Mr Shah is a hero to be celebrated and followed if we want a world where we can live and breath in. Hyderabad Subway’s Issue : We Serve Fresh Bread, Veggies And Cockroaches!